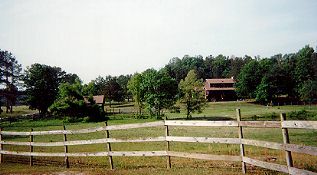 This beautiful 18 acre horse farm is complete with stocked pond and Canadian geese. The private airstrip is 1800 ft. of perfect sod. Or just 10 minutes away is 5200 ft. of paved runway with tie down, lights and radio contact. The setting is country complete with wrap around porch, swing, and hammock. Relax after a day of business, shopping, scenic horseback riding or historical sight seeing. Visit the Coca Cola museum, Atlanta's Underground, Stone Mountain, or fly 30 minutes to Callaway gardens for breakfast, golf, or just tour the gardens. Fine dining, health clubs, & golf courses just minutes away. Business travelers welcome. "Horse hotel" available with stalls and private paddock. Breakfast time and menu is healthful at your request. Contact 770-251-0032 for prices and availability. This and other Sharpsburg Bed and Breakfast Inns can be found here in The Register. Romantic Country Inns, Getaways and B&Bs offer a great Georgia lodging alternative to big hotels.